Ceylon Tea Trails is probably the most coveted place to stay in Sri Lanka, and a perfect place for history and tea lovers like us. 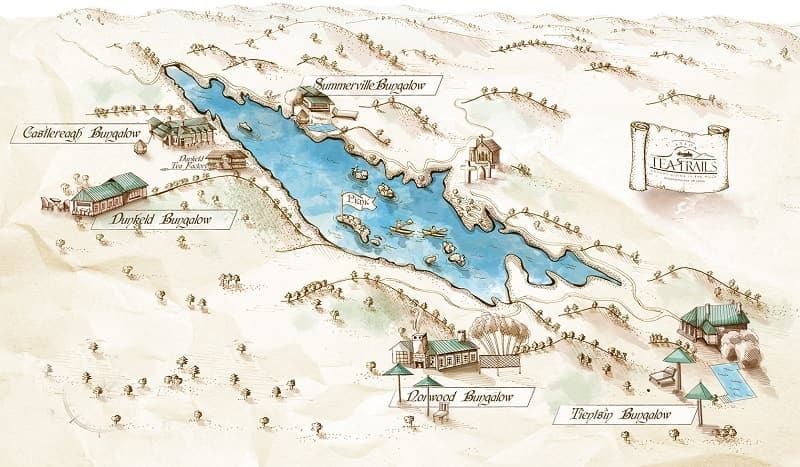 Nestled among the scenic tea-carpeted hills of the Bogawantalawa region, you’ll find five colonial-era tea planter bungalows which have been turned into a private luxury resort. Each of the historical bungalows has its own distinctive character and offers a boutique luxury experience in Sri Lanka’s Tea Country. Each of the bungalows offers 4 to 6 unique rooms and a dedicated butler, chef, and house staff. 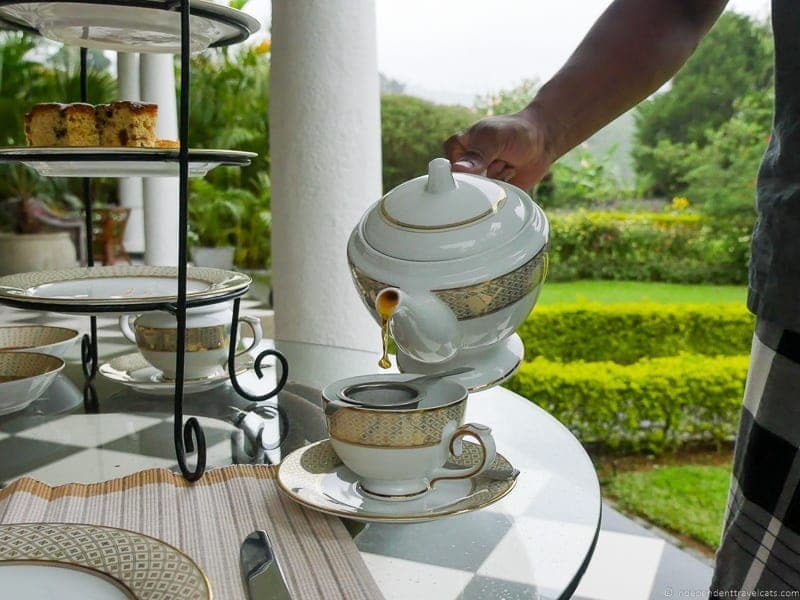 Ceylon Tea Trails was the first Relais & Châteaux property in Sri Lanka and remains one of only two in the country. A stay here is worry and bill free as rates include all meals, most drinks, laundry, taxes, and services. A typical day here includes waking up to a traditional Bed Tea each morning served by the butler, spending the afternoon by the pool or taking a scenic hike, and then finishing the day with canapés and an evening drink by the fire before heading off to a 4-course dinner. 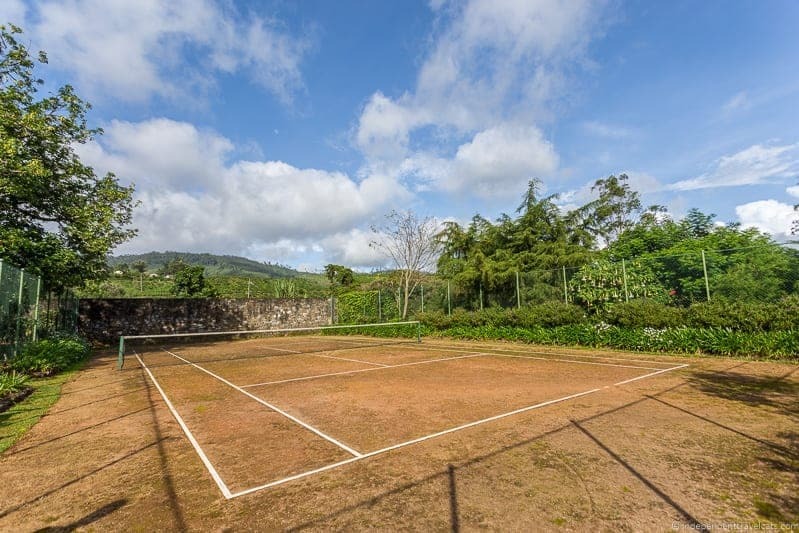 For the active, there are guided hikes and climbs of Adam’s Peak, day excursions, tennis, croquet, a tour of a tea factory, kayaking, and swimming. For those who crave relaxation, there are swimming pools, the gardens, board games, in-room spa treatments, paneled libraries, and bay windows framing beautiful scenery. 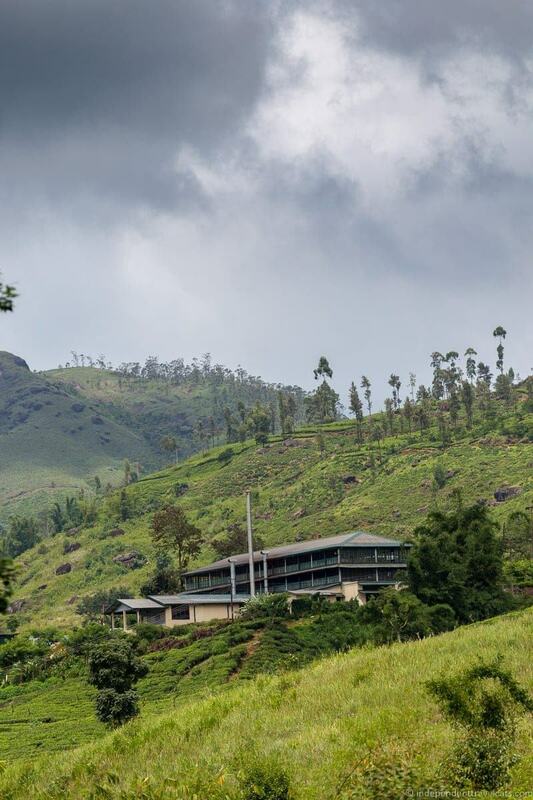 We had an absolutely blissful 2-night stay at Ceylon Tea Trails, and we will provide you with a full description of our own experience as well as all the information you need to decide if a trip to Tea Trails should be in your future! 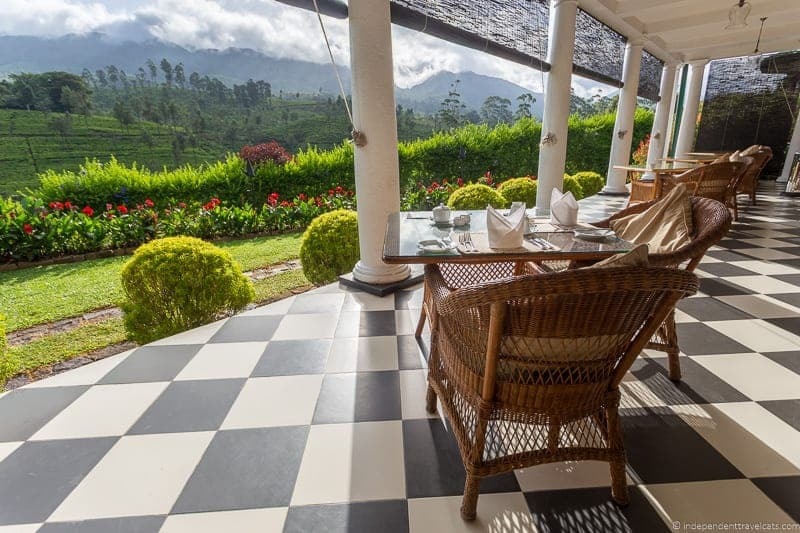 Address: Each of the five Tea Trails bungalows has its own address, but each are located among the hills of the Bogawantalawa region in the Dimbula district in south central Sri Lanka. They are located near the town of Hatton and the village of Tientsin. 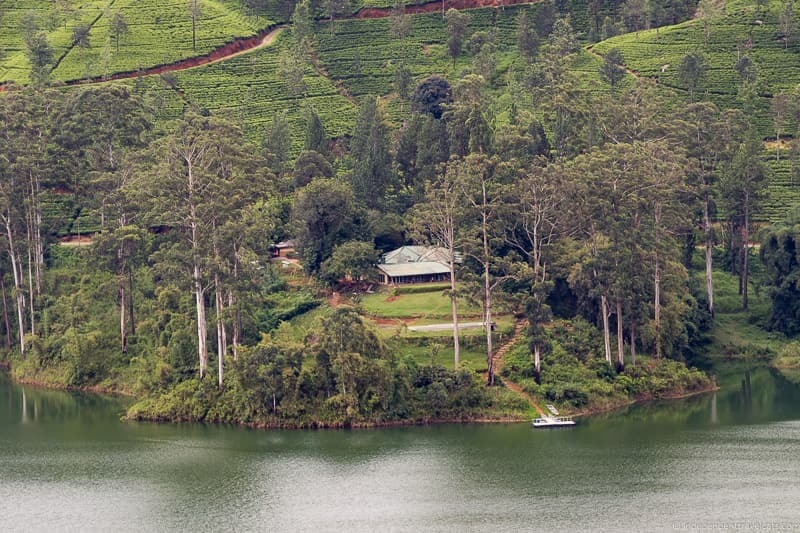 The five Ceylon Tea Trails bungalows are located between 2 km and 15km (1.25 to 9 miles) from each other. Getting Here: You have a few options for reaching Tea Trails, you can arrange a SUV transfer, take a train, join a tour that stays here, drive yourself, or arrive by helicopter or an amphibian aircraft. 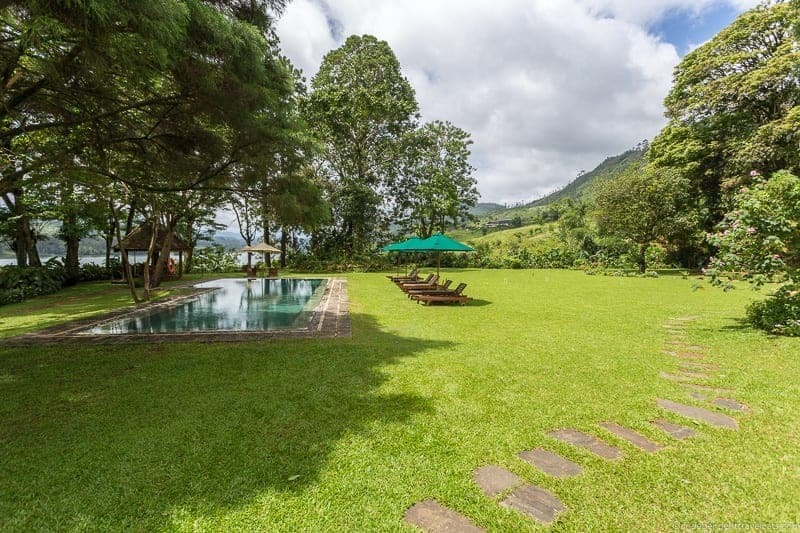 If you travel by train (services from Colombo, Kandy, and Nanu Oya), you’ll want to arrive in Hatton station and Tea Trails can then transfer you by private SUV directly to the hotel. From Hatton, it is a 20 minute drive to the nearest Tea Trails bungalow Summerville and a 45 minute drive to the farthest, Tientsin. If you want to travel by helicopter, Tea Trails can provide a list of companies that provide transfers to and from the hotel and rate sheets. Cinnamon Air operates flights that land in Castlereagh Reservoir (just next to both Castlereagh and Summerville bungalows). If driving yourself or taking an overland transfer, it is about a 4 to 5 hour drive from Colombo, 2 hours from Nuwara Eliya, or 2.5 hours from Kandy. We came overland in a SUV with our driver/guide from Colombo as part of a private tour we arranged with Jetwing Eco Tours, and there are a number of tour companies that can arrange a stay here as part of your itinerary. 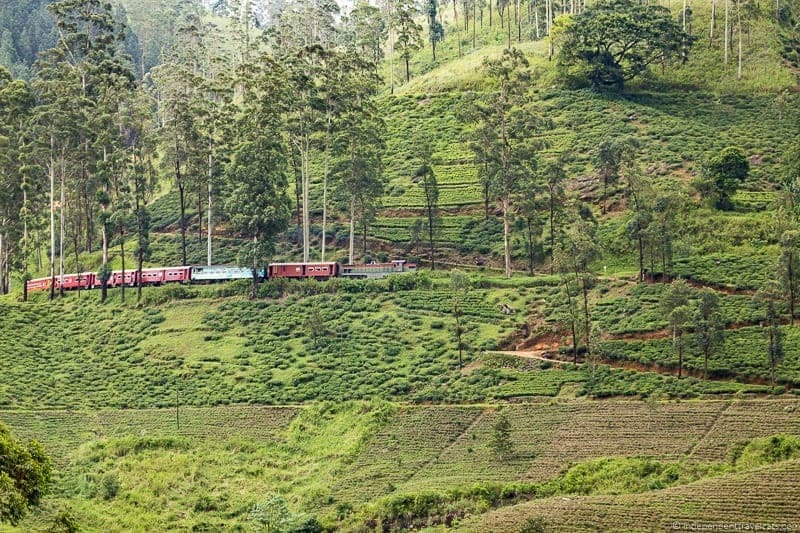 Note that an overland drive from Colombo can be a bit long and tedious so you may want to consider the scenic train ride from Kandy to Hatton or a seaplane ride. Room Types: There are currently 26 rooms available across the 5 bungalows, and there are four room types offered at Ceylon Tea Trails. 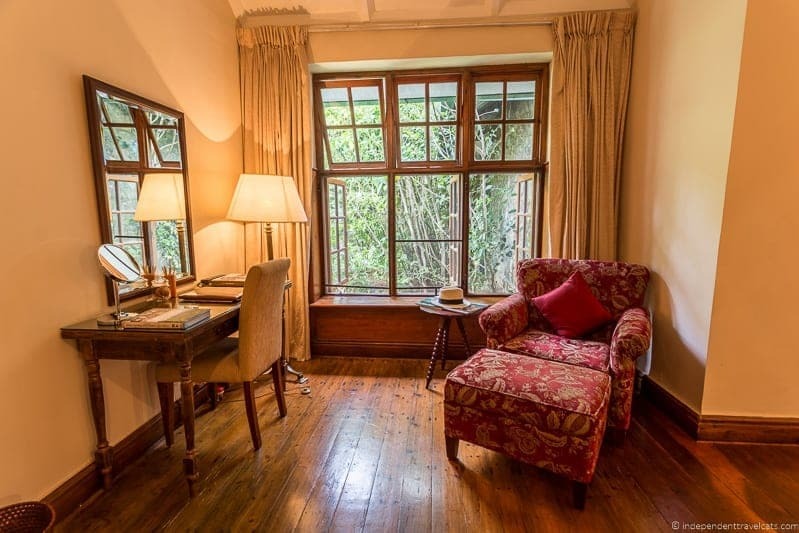 There are Luxury Rooms (smallest rooms), Master Suites with a separate living room, Garden Suites with a verandas to a private garden area, and a secluded Owner’s Cottage. Entire bungalows can also be rented out. Rooms and suites are each unique and decorated in neo-colonial or classic English styles, containing both antiques and colonial-era style luxury furnishings. ll rooms rates include a private butler service, gourmet meals, afternoon tea, snacks, alcoholic drinks, wireless Internet, and a complimentary tea factory tour. They also include service charges, taxes, transfers between bungalows and to Hatton, local telephone calls, and laundry service! 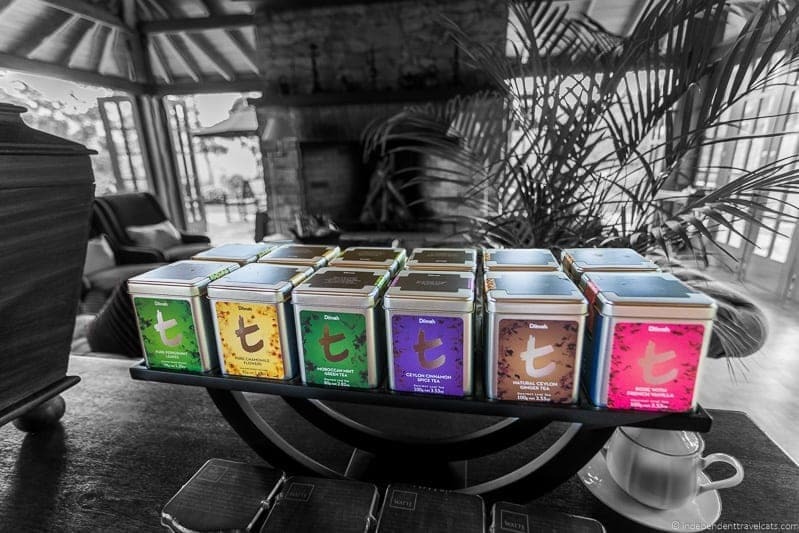 For discounts, check the Tea Trails website for special offers and packages. Children are allowed at Tea Trails however parents should exercise judgement when booking with young children. A minimum 2-night stay is requested, although you can call to see if they have availability to accommodate a 1 night booking. Dining at Tea Trails: Tea Trails offers an inclusive experience with room rates including all meals, snacks, drinks, and afternoon teas. Bed teas, breakfasts, lunches, cream afternoon teas, dinners, and snacks are all served at each bungalow. Meal specialities are either English/Western or Sri Lankan and often you have an option to choose which type of cuisine you’d prefer for each meal. All bungalows offer both indoor and outdoor dining areas. There are options to have meals and afternoon tea on the verandah, lawn, or in the dining room. Meals can also be arranged in one’s suite with advance notice. 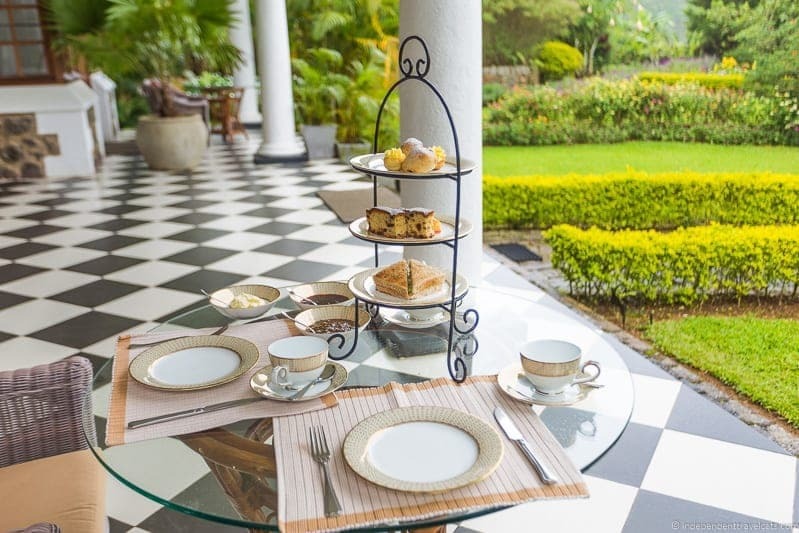 One of the great things about Tea Trails is that you can arrange to have meals at any of the Tea Trails bungalows during your stay, just tell your butler and they can arrange for you to have your meal or afternoon tea served at any of the other bungalows that you may want to visit. Activities offered at Tea Trails: Ceylon Tea Trails offers a number of activities for guests, many of them complimentary. These include swimming (all 5 bungalows have their own swimming pool), a tour of the Dunkeld Tea Factory (available daily), billiards, board games, kayaking, croquet, tennis (Tientsin Bungalow has its own court), hiking (there are suggested trail guides available for guests), boat trips across Castlereagh Reservoir, and mountain biking (bikes and gear available at bungalows). 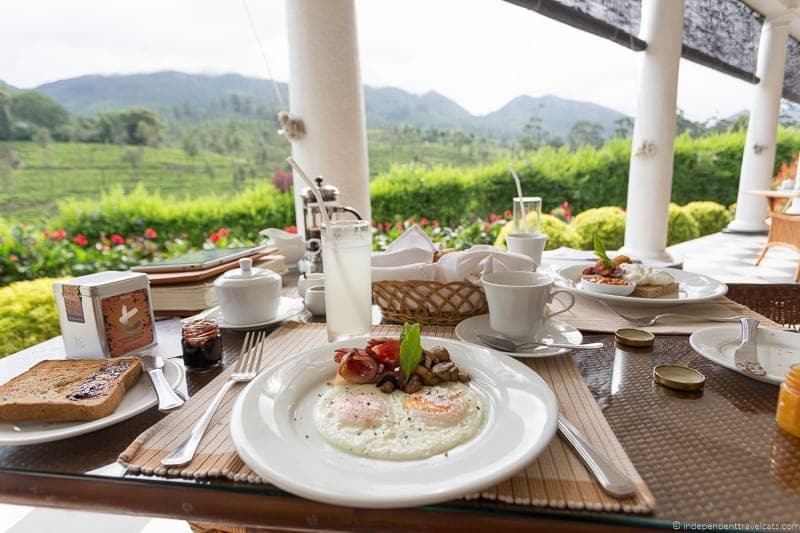 Guests can also arrange for guided day trips to number of nearby towns and attractions, guided hikes or bike rides, a climb of Adam’s Peak, golf excursions, and in-room spa treatments. Can I visit Tea Trails without a Booking? : No, Ceylon Tea Trails bungalows are private property and cannot be visited without a prior booking. So please be sure to book in advance if you are interested in staying here. Although they are often booked full, last-minute bookings may be possible at times so don’t hesitate to call them. More Information about Ceylon Tea Trails? There is an excellent website for Tea Trails, where you can get more information or make a booking. You can also email them at reservations@resplendentceylon.com or call them at +94 11 774 5700 for reservations or questions. Tea Trails is operated by Resplendent Ceylon Ltd. which also operates Cape Weligama, a beach resort that sits along Sri Lanka’s southern cliffs which is currently the only other Relais & Châteaux resort in Sri Lanka. 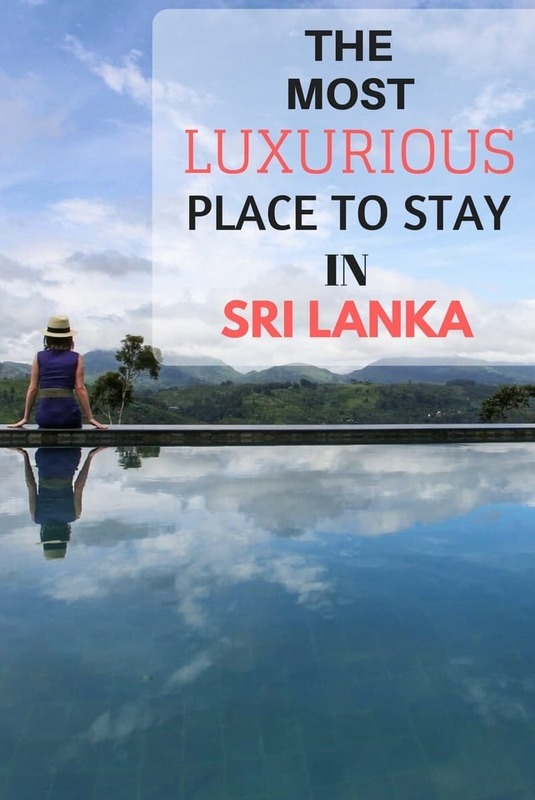 This dramatically situated property is a place to check out if you are hoping for some seaside time while in Sri Lanka and discounts are available for packages that include stays at both hotels. Future luxury properties are planned for both Yala and Sigiriya. 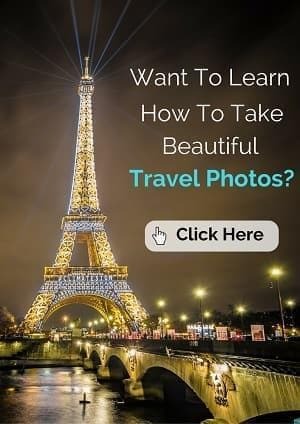 If your travels are taking you to other parts of Sri Lanka, I’d recommend checking out the Sri Lanka Tourism website which is full of good information and tips and this suggested 2-week itinerary of Sri Lanka. You can also read about our most recent 5-day Sri Lanka trip experience that took us from Colombo to Tea Country to leopard hunting (for photos!) in Yala National Park and our recommended 1 week Sri Lanka itinerary for couples. The history of the Tea Trails property is intricately entwined with both the history of the country and Dilmah Tea. 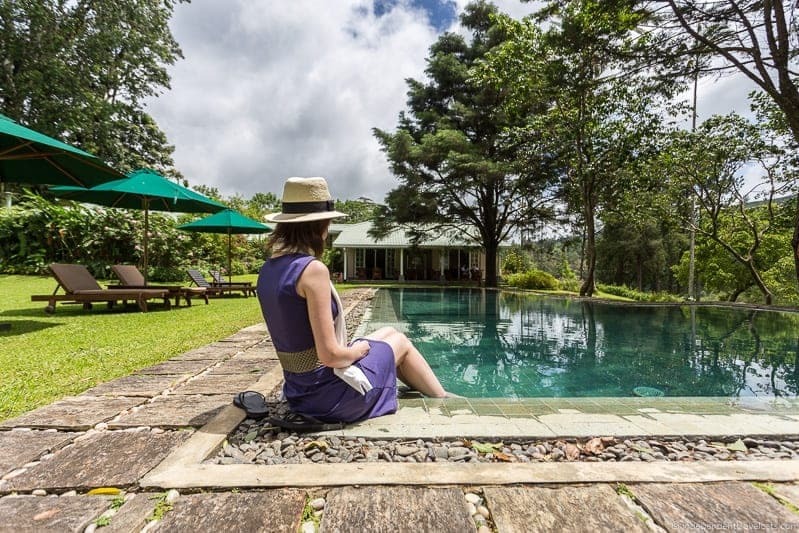 The hotel consists of 5 colonial bungalows nestled within one of the best tea regions in Sri Lanka. All 5 of the bungalows were built while Sri Lanka was the British colony of Ceylon between 1802 and 1948. It was during the British colonial period that a network of roads were developed, the country was surveyed, hospitals were opened, the railway system was introduced, and major shipping ports were developed to aid in the importing and exporting of goods. It was also the British who established the major coffee and tea plantations in the country. Although the Dutch had first introduced coffee in Sri Lanka, it was the British (with the labor of the local people) who were able to open large commercial plantations making it a profitable crop. However, due to disease and growing conditions, tea soon replaced coffee with Scottish planter James Taylor starting the first tea plantation in 1867. The cultivation and exportation of spices, coffee, and tea in Sri Lanka was very important to the development Sri Lanka, and the infrastructure set up by the British allowed for the large-scale worldwide exportation of tea and other agricultural products. 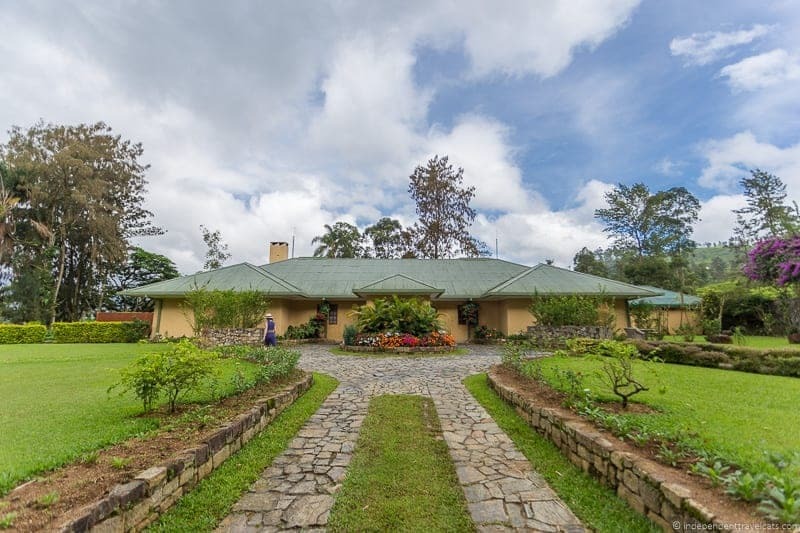 There are now six major tea regions in Sri Lanka, and Dimbula, where the Tea Trails bungalows are located, was one of the first areas to be planted in the 1870s. 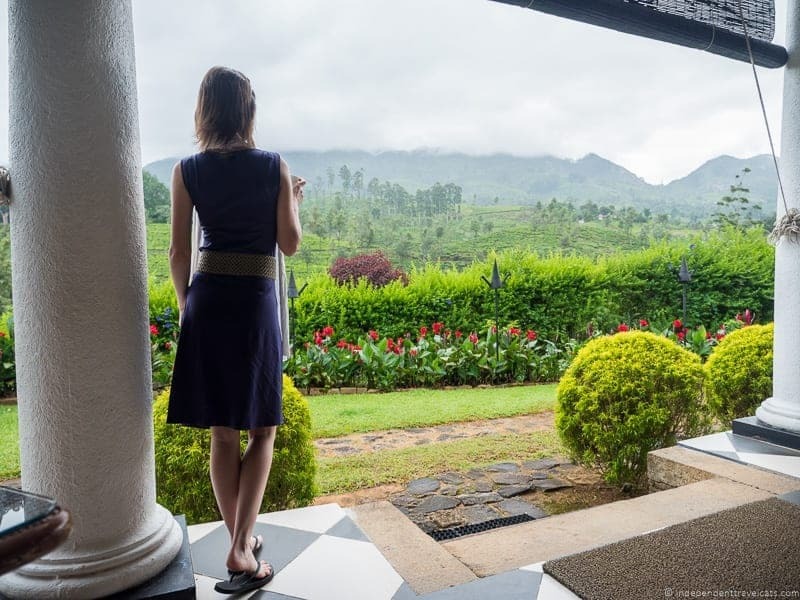 It is here that many British tea (and coffee) planters set up homes and villas in Sri Lanka in order to be able to supervise work at their tea fields and factories. Today five of these colonial-era tea planters’ bungalows have been restored by Dilmah as Tea Trails. But what is Dilmah and how are they involved in the story? Although Sri Lanka (then Ceylon) was no longer a colony of Britain after 1948, the British continued to dominate the top positions related to the tea industry in Sri Lanka. Eventually government pressure would allow six Ceylonese men to become the first native tea tasters in 1950, one being young Merrill Joseph Fernando. 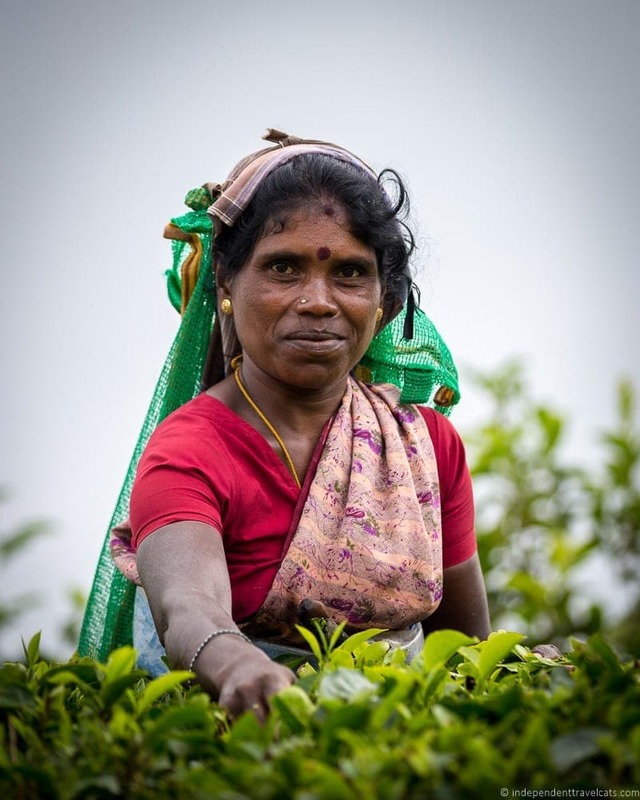 As Fernando continued to train and work in the tea industry, he noticed that Ceylon tea was increasingly being mixed with teas from other origins and that profits from the tea mainly went to foreign investors. He dreamed of owning a company that sold and marketed 100% high quality pure Ceylon tea and keeping the profits within his own country. The 1970’s were very turbulent in the tea industry (and the whole country!) with the government nationalizing the tea fields. Then after not being able to maintain them, they sold them back to private investors. In 1988, Fernando would finally fulfill his dream in the founding of Dilmah, which is now Sri Lanka’s most recognized international brand of tea. Dilmah is a family-owned company that sells single origin 100% pure Ceylon tea that is processed using traditional methods and packaged at the source. Profits are shared with the workers and local communities, and a percentage of the profits are also used to fund both the MJF Foundation and Dilmah Conservation. In 2015, Merrill J. Fernando received the Business for Peace Award in Oslo, given by the Award Committee of Nobel Laureates in Peace and Economics. Merrill Fernando’s two son, Dilhan and Malik (their names led to the name Dilmah), continue in the family business. 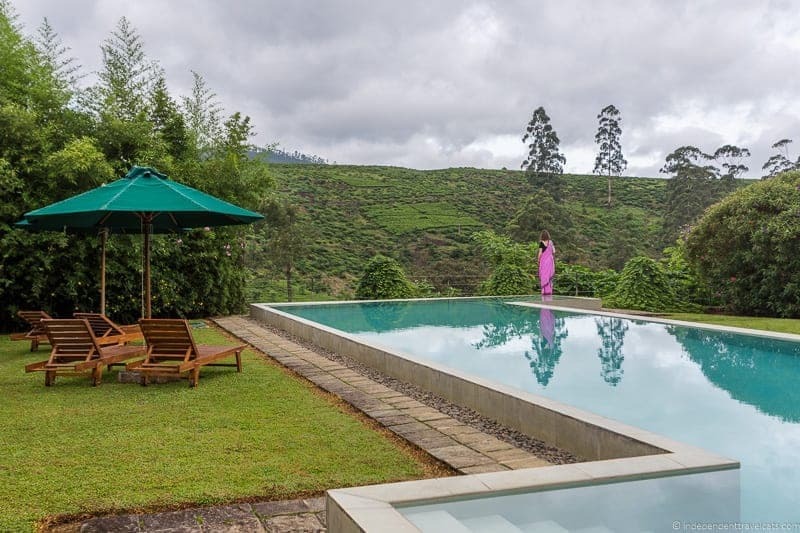 It is Malik that has headed up the leisure tourism side of the business, forming Resplendent Ceylon and opening their first luxury resort Tea Trails in 2005. 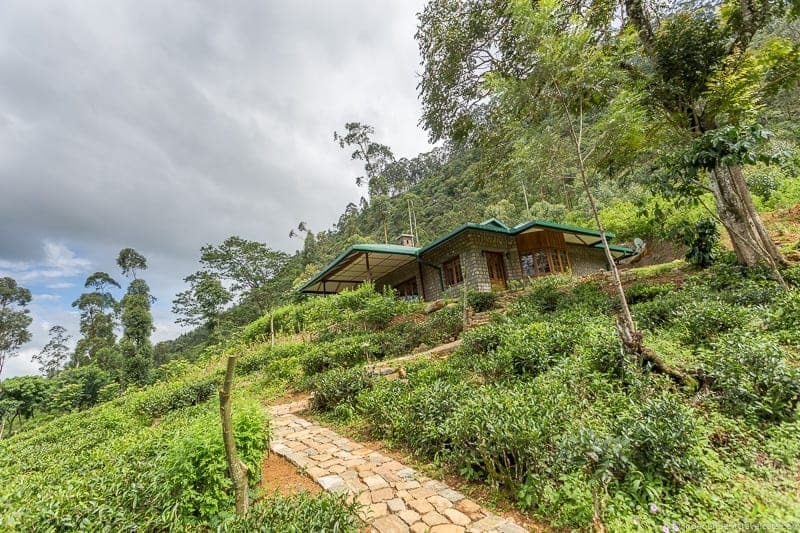 Tea Trails is the world’s first tea bungalow resort. How do I choose from the 5 Bungalows at Tea Trails? There are currently 5 bungalows at Tea Trails, with the latest addition being the recently opened Dunkeld Bungalow. 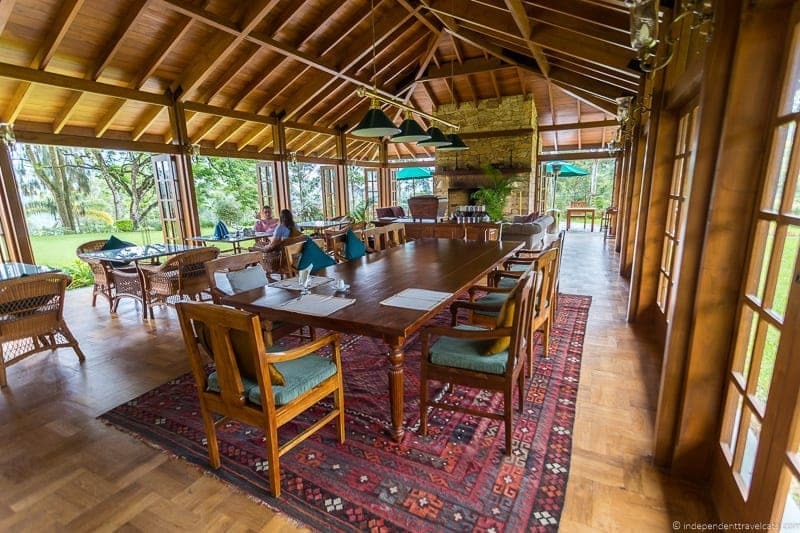 One of the great things is that you can stay at more than one bungalow if you are staying for multiple days at Tea Trails, or you can just visit some of the other bungalows as we did during walks or for meals. Each bungalow offers 4-6 rooms and comes with its own dedicated staff (manager, butler, chef, and houseboys). 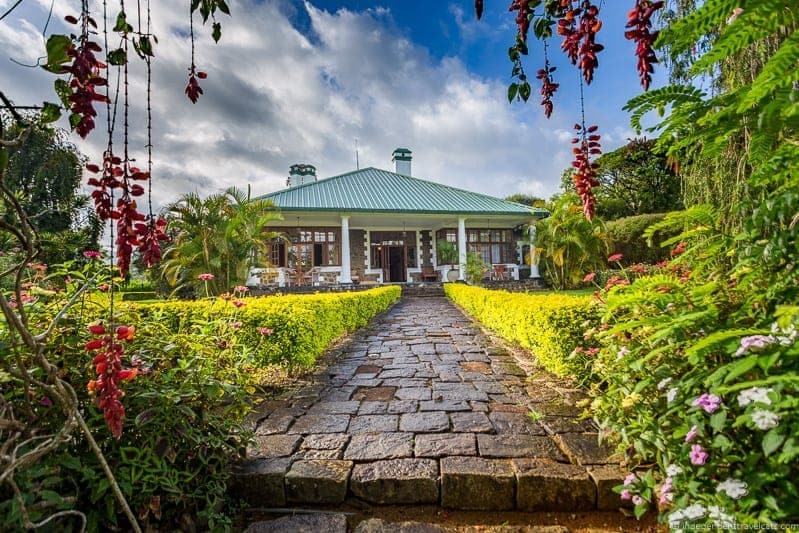 All bungalows are from the British colonial era and offer many of the same amenities, for instance all 5 have a spring-fed swimming pool and offer in-room spa treatments. However, there are differences in some of the amenities as well as the decor of the properties. 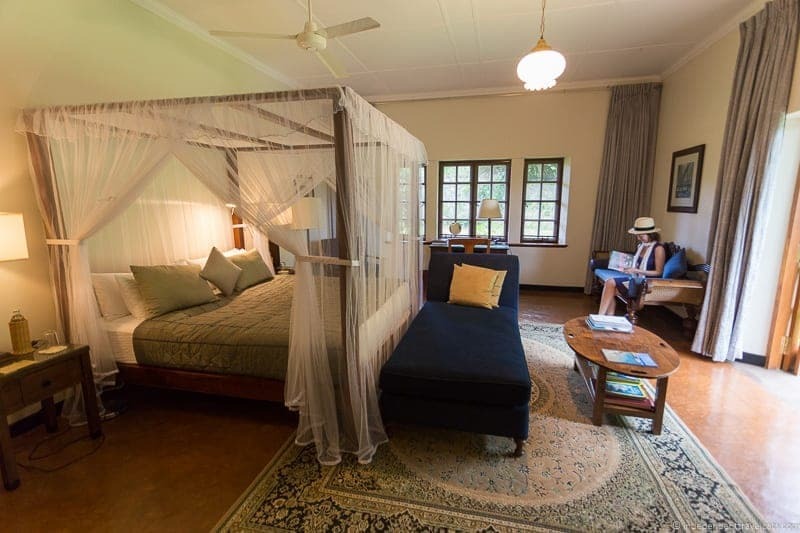 Note that some of the bungalows may not be open during your visit as they close for periods of renovation at times and given the limited number of rooms, bungalows are often fully booked months in advance so it is best to choose a few favorites. During our stay we were able to visit 4 of the 5 bungalows (Summerville was temporarily closed for renovation). 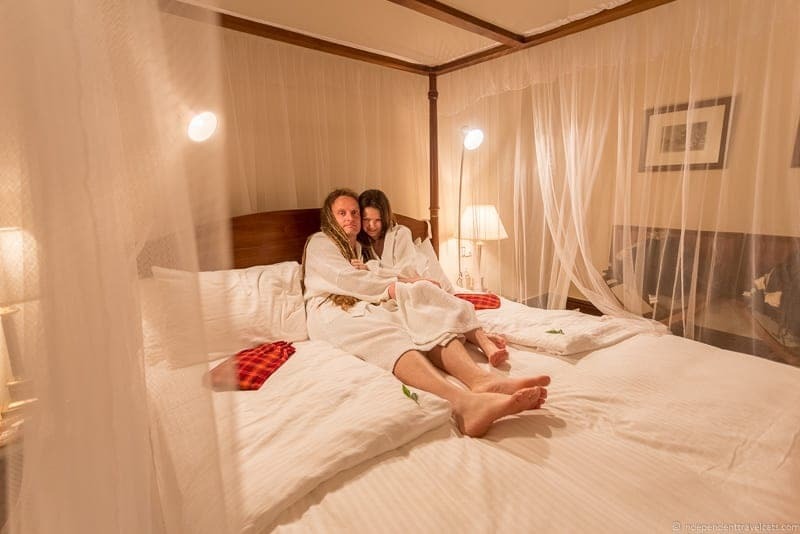 We saw just about every unoccupied room in four of the bungalows ranging from the Luxury Rooms to the Owner’s Bungalow, and honestly we would have been happy to sleep in any of them. If you are keen to have a garden, private terrace, private sitting room, or certain view, then I would specify this on booking. Also note that all rooms have a shower, but some are affixed over the bath tub and some are separate walk-in showers, so if a walk-in shower is important, be sure to request it. You can also see available rooms and floor plans for each of the bungalows on the Tea Trails website. Norwood Bungalow was originally built in 1890; however, it was rebuilt in 1950, giving it a 1950’s style. The bungalow at Norwood offers 6 rooms and commands a fine view of the eastern end of the Bogawantalawa valley and has some amazingly large bamboo surrounding it. This was our driver’s favorite bungalow and will likely to appeal to anyone looking for a bungalow with a modern feel. 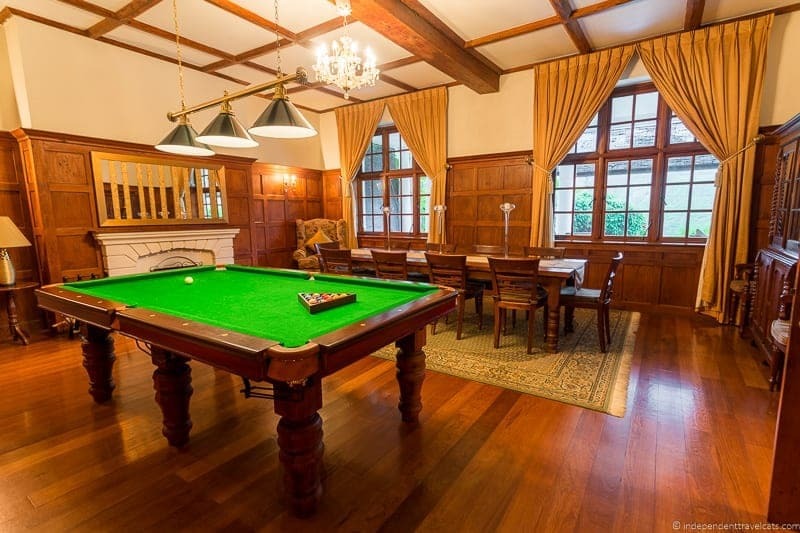 It has a large swimming pool, lounge, billards room, library, croquet lawn, and sun deck. Summerville Bungalow was built in 1923 and offers 4 guest bedrooms, decorated in the style of a country cottage. Summerville is situated high above the Castlereagh Reservoir and offers great views over the water and tea-covered mountains. 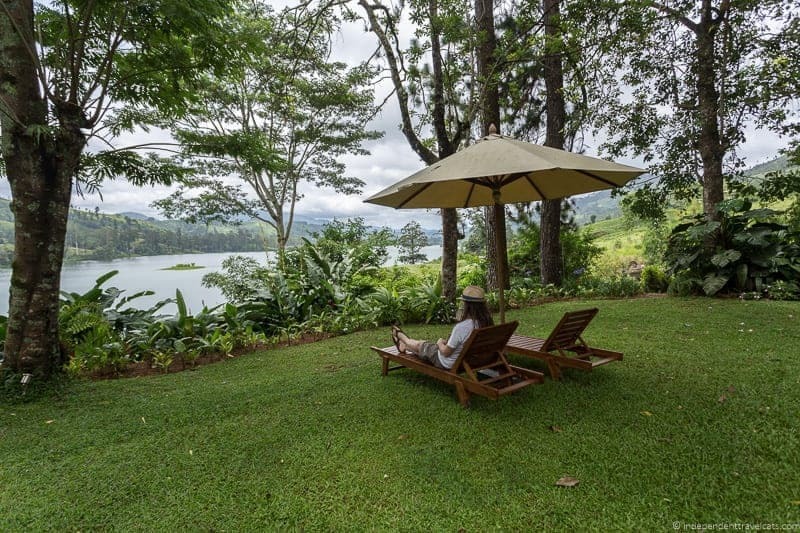 This villa feels a bit more secluded since it is on the other side of the lake from the others, but an easily arranged short boat ride can bring visitors back and forth across the lake to visit the tea factory and other bungalows. This bungalow is also the easiest to rent out for a group and is likely a good bet for those seeking peace and quiet. It has a swimming pool, sun deck, summer house, croquet lawn, and gardens. Sadly, we did not have a chance to personally tour Summerville as it was closed for renovations, but here is a glimpse of it from across the lake. 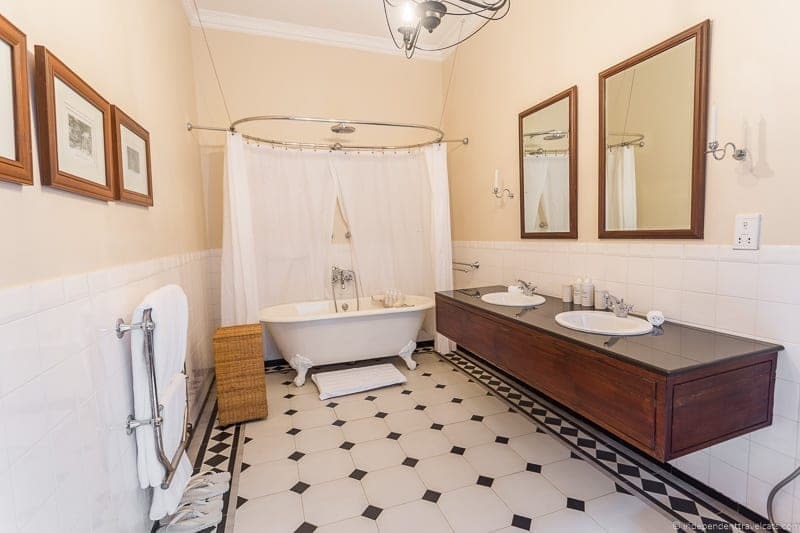 Castlereagh Bungalow was built in 1925 and offers 5 guest bedrooms, and is a popular guest favorite with its eclectic style. It incorporates colonial elements but feels quite modern at the same time. Nestled in a wooded area, Castlereagh is located on the opposite side of Castlereagh Reservoir from Summerville, and offers great views of the lake. It has some of the best gardens of all of the bungalows and two summer houses. Castlereagh also offers a swimming pool, croquet lawn, and a library. Dunkeld Bungalow was built in 1925 and offers 4 guest bedrooms and the detached Owners’ Cottage. This is the most recent bungalow to open at Tea Trails, restored in 2015. Dunkeld is located on the opposite side of the Castlereagh Reservoir from Summerville. 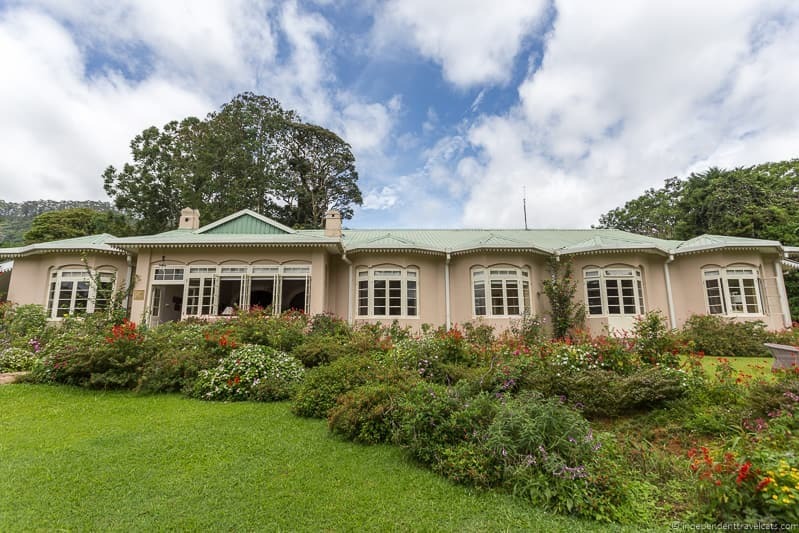 It is situated in a position high above the reservoir and offers amazing views over the lake, tea fields of the Dunkeld estate, the Dunkeld Tea Factory, and mountains. 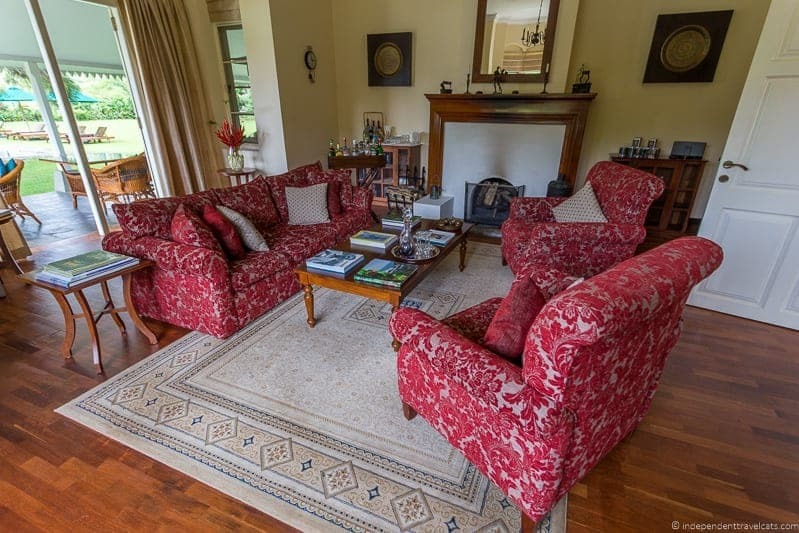 The Owners’ Cottage is located just above the Dunkeld Bungalow that is accessed from a small private path, and is perfect for a romantic honeymoon or private family getaway. Dunkeld offers an amazing infinity-edge swimming pool, hot tub, sun deck, library, and croquet lawn. Our photos can’t do it justice as it was still being cleaned and renovated before its grand opening the following week! Tientsin Bungalow was originally built in 1888 but rebuilt in 1939. 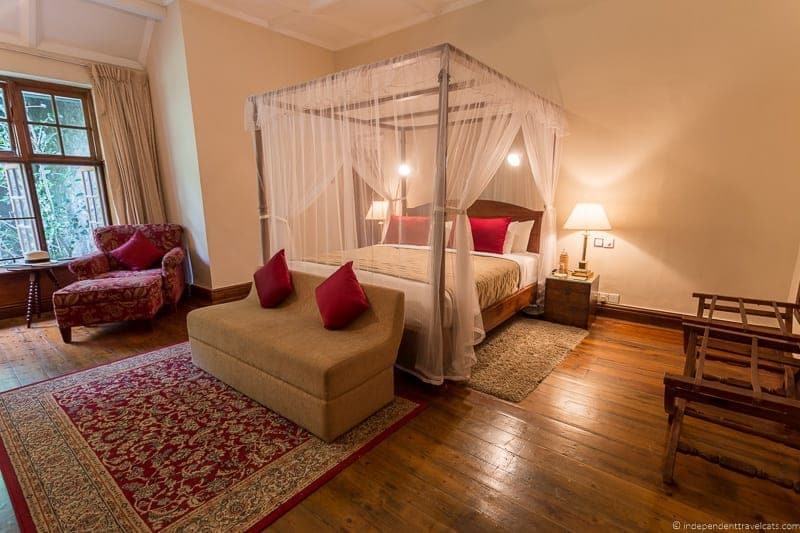 It offers 6 guest bedrooms, and is decorated in High Colonial style. There is a real Old-World feel to the classic decor and furniture. This one is located the furthest from Hatton compared to the other 4 bungalows. 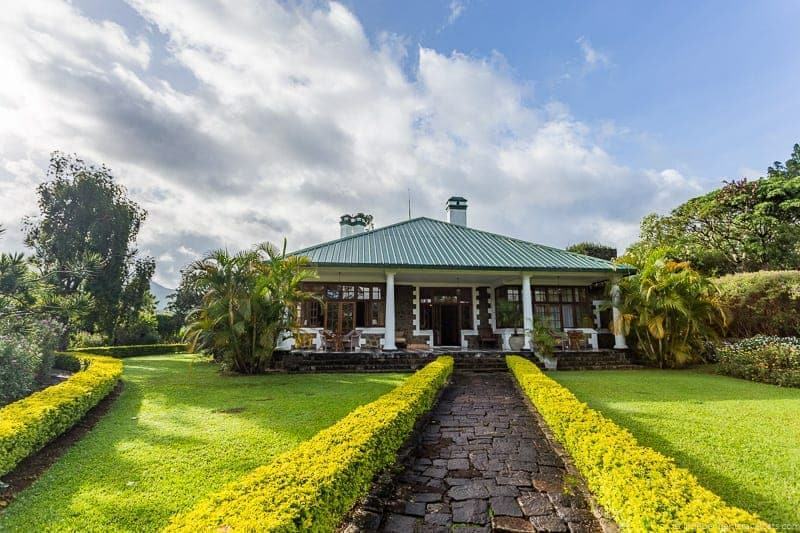 Tientsin Bungalow offers guests views of the tea-carpeted mountains towards the World Heritage Horton Plains National Park. 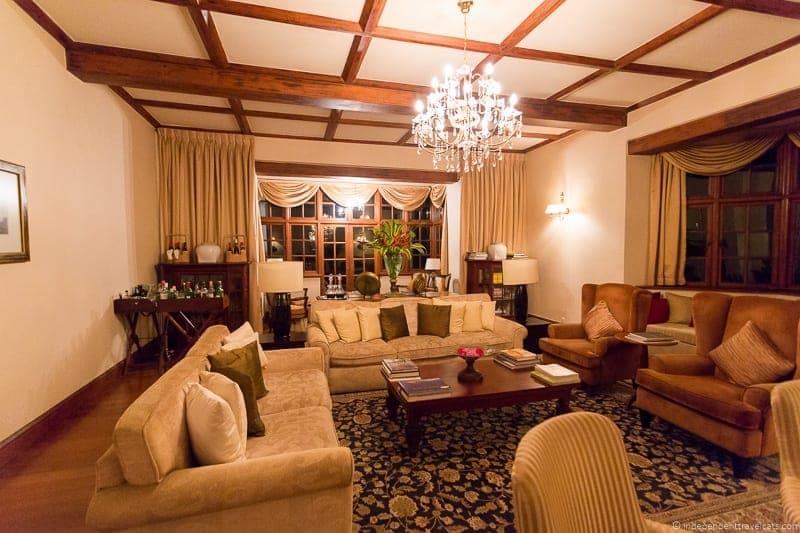 It has the most classic feel of all the bungalows and is the only one with a tennis court. 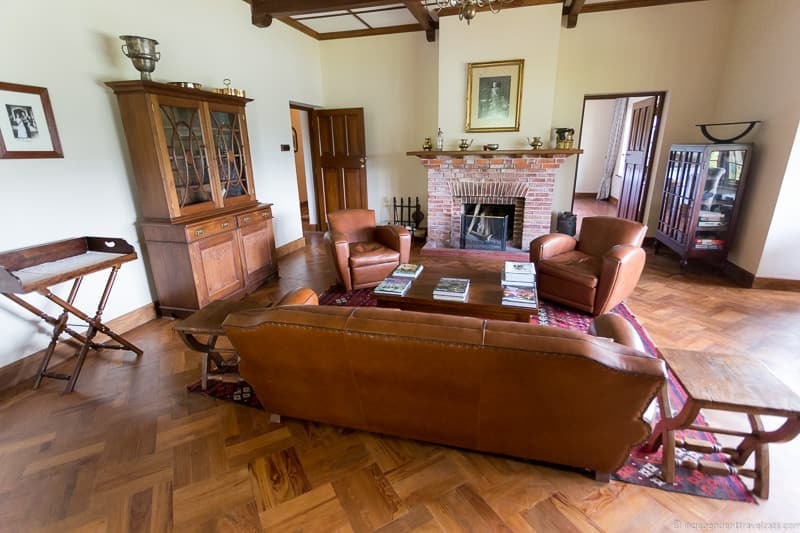 Tientsin Bungalow offers a swimming pool, clay tennis court, billards room, library, croquet lawn, and gardens. This was our home for our 2-night stay! We spent two nights at the Ceylon Tea Trails as part of a 5 day trip we took that started and ended in Colombo. We were traveling with Jetwing Eco Holidays and our driver/guide Nawfer picked us up from our hotel in Colombo and drove us to Tea Trails. Jetwing Eco Holidays specializes in custom itineraries in Sri Lanka and also has a suggested Tea Country tour itinerary. You can read more about our full tour in Sri Lanka in an article Laurence wrote. The drive took about 5 hours and was a bit tedious with traffic. However, it was quite scenic once we reached the lush tea growing region as there are some beautiful waterfalls, ravines, tea estates, and valleys. We were warmly greeted by Tea Trails staff upon arriving at Tientsin, our bungalow for the 2-night stay. Staff carried in our luggage and showed us into the lounge area where we were given a welcome drink which was a refreshing juice and tea infusion. Our butler Chaminda introduced himself, told us a little about the property, and asked us how we’d like to spend the rest of the day. We decided to go to our rooms to unpack and get refreshed and then to have afternoon tea. Chaminda told us to treat the bungalow like our home and that no room keys are provided unless requested, which was a nice feeling! We never requested a key but did stick a few valuables in the in-room safe. Next decision was where we wanted to have our afternoon tea (side terrace, front terrace, dining room, garden). During afternoon tea (on the side terrace in case you were wondering! ), the chef came out to introduce himself and go over the dinner menu and ask us about breakfast preferences the next morning. Oh such a rough life with all this personal attention and decisions. This was the beginning to our two days in Sri Lankan paradise! Our home for two days! We were in the Brebham Luxury Room at Tientsin bungalow. 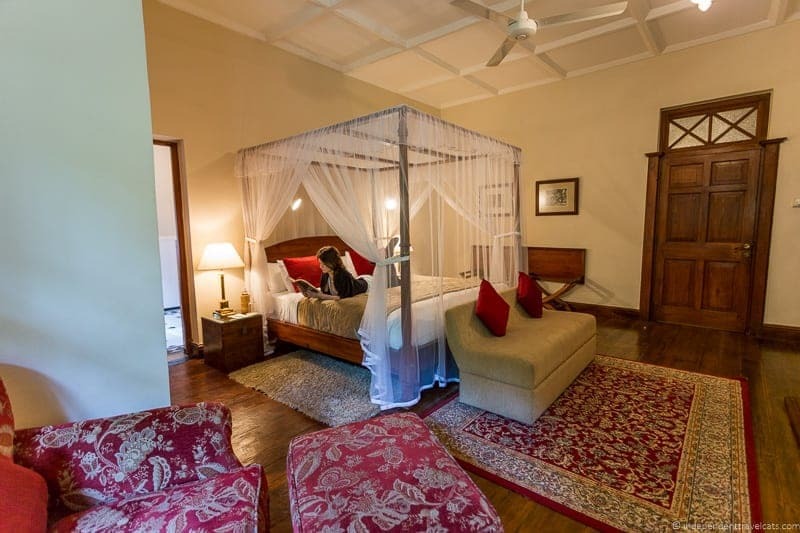 A luxury room is the lowest category of room offered by Ceylon Tea Trails, but I think it is almost impossible to have a bad room at Tea Trails after checking out a good number of the rooms across the bungalows. Our room was perfect for us, it was spacious and decorated in an Old World style with modern amenities. It had hardwood floors, a large wooden wardrobe with lots of storage, a 4-poster king sized bed with luxurious linens, a comfortable sitting chair, a large wardrobe for storage, and a desk. The bathroom was large and spacious with double sinks, a claw foot bathtub, heated towel rack, and rain shower. There were lots of little extras in the room like tea infused soaps and bath products, waffle-linen robes, stationary, plenty of bottled water, acupressure flip-flops, books about Dilmah and the tea country, and even a jar full of tea biscuits. The room had an Old World decor, but it offered all the modern amenities we could want, including fast complimentary wifi, a hair dryer, a safe, and plenty of electrical outlets. In the evening, we’d find a flannel-covered water bottle in our bed to ward off any chills. We found Tientsin and the other bungalows we visited to be quiet and peaceful throughout our stay, but I will note that we had heard from past guests that sometimes there are loud celebrations from nearby villages as well as issues with guests’ bringing noisy children. Obviously these things are largely outside the control of the hotel, but if you are sensitive to noise, I would note this upon booking to try to get the quietest bungalow. The service at Tea Trails is friendly but professional, and staff went out of their way to accommodate us and no request seemed to be an inconvenience. We found this was the case at each of the bungalows we visited. Each bungalow comes with a head butler, chef, and a small team of house staff. A staff member is available 24 hours a day in case you need anything. In our guest room at Tientsin, there was a service button located next to the bed, and when rang our butler or one of the other staff members would come to our room. We actually never intentionally used the service button, but I accidentally bumped it one night thinking it was a light switch. It was late and I woke up poor Lanka who knocked on our door within a couple of minutes to check on us. So we know it works! 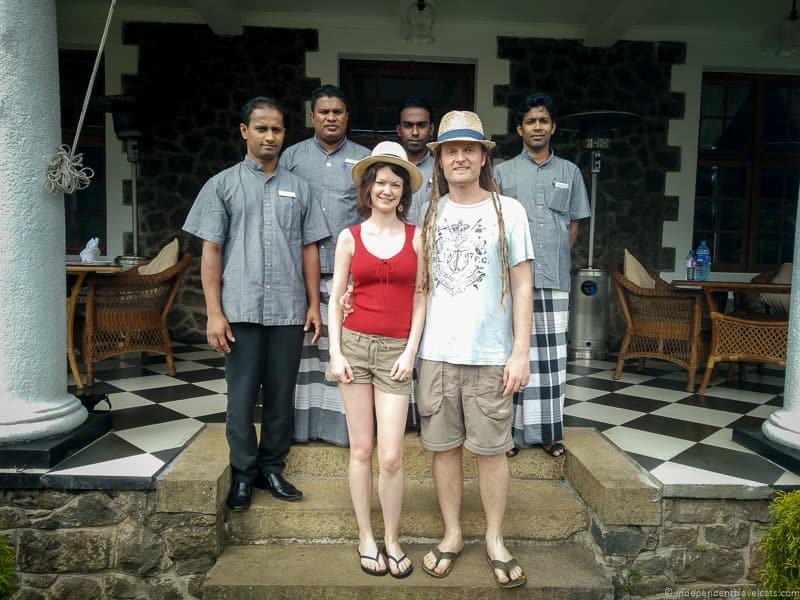 Service is definitely top-notch here and the best we have experienced anywhere in Sri Lanka. 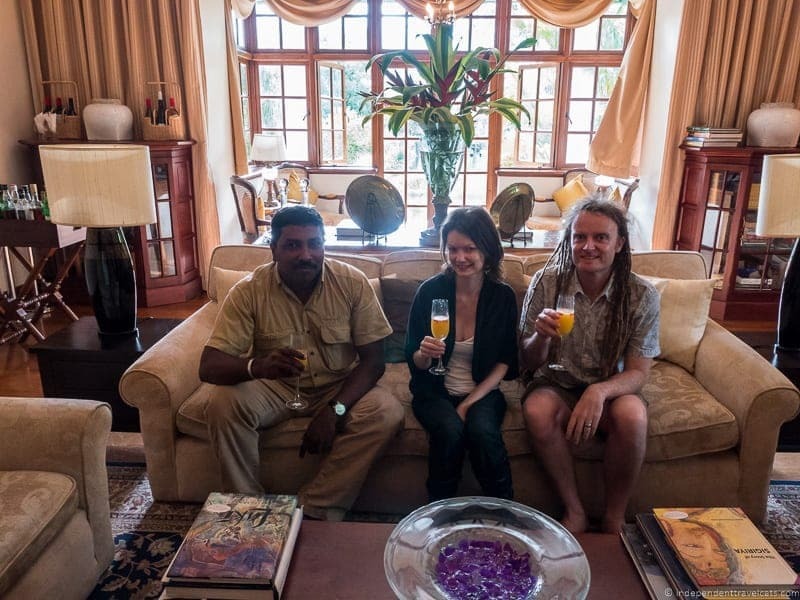 We’d love to especially thank our butler Chaminda Bandara and Lakmal for taking such good care of us during our (way too) short stay, as well as Chef Chaminda, Abeywardena, and Kasun. Many people coming to stay at Ceylon Tea Trails are interested in learning about the tea industry in Sri Lanka and learning about the tea making process. Luckily Tea Trails offers a daily Tea Trail Experience tour that is complimentary for all guests and is led by the Resident Tea Planter. We did this on our first full day at Tea Trails. First, we were shuttled from Tientsin to the Dunkeld Tea Factory located on the Dunkeld Estate. The Tea Factory has a scenic location and is surrounded by tea fields as well as housing, a medical care center, and a child development center for the workers. Upon arrival, we were greeted and led into a room where there are informational exhibits on the tea industry in Sri Lanka and the tea making process. We were soon joined by another couple, and then led outside by the resident planter, Mr. Marlon De La Harp, to see the tea fields. He showed us tea plants of various ages and explained the work related to planting and picking the tea leaves. All the tea is hand picked and we were welcome to give it a short go and pick the “two leaves and a bud”. We got to watch a woman picking tea and then watch a group of pickers bring in their leaves from the fields for weighing. I had actually learned to picked tea once in Vietnam, and it is amazing how much tea a skilled worker can pick in a day! Next we toured the actual factory. Dunkeld Tea Factory is about 150 years old and uses traditional methods to process its tea, which have largely remained unchanged for the past 100 years. The tea produced here is predominately black so we learned about this process from start to finish. All teas come from the leaves of the Camellia Sinensis plant, it is just the actual process and oxidation that differs in whether the leaves will produce black, green, oolong, or white tea. 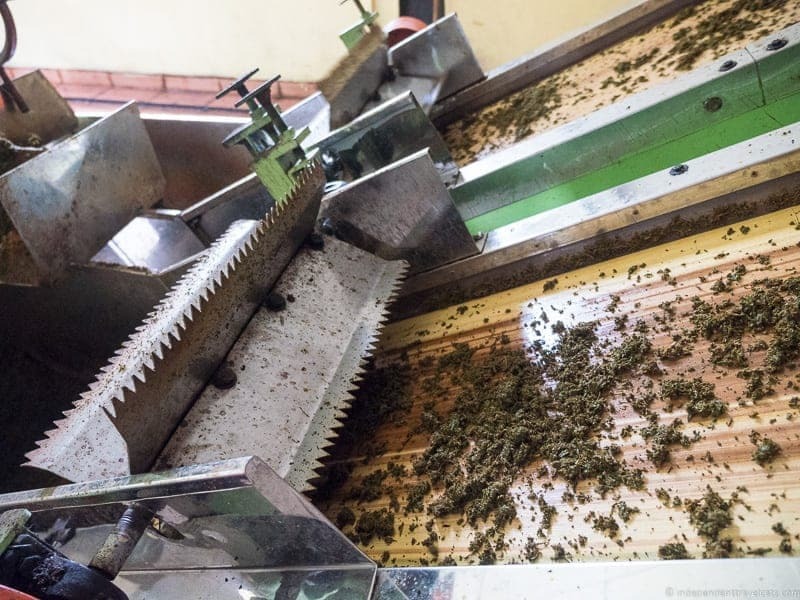 We learned about the rolling, oxidizing, firing, drying, grading, and packaging of the teas, and got to see some of the machinery in action during the tour. At the end of the tour, we also learned about the art of tea tasting and got to sample a couple different tea grades. There was also the option to purchase some of the tea directly from the factory, and we decided to buy one bag to take home with us. The tour took about 1.5 hours and was quite relaxed and informative. Mr. De La Harp was very pleasant and was happy to answer all our questions. In addition to the tea factory tour, Ceylon Tea Trails offers a number of activities for guests and many of these are complimentary, such as swimming, croquet, tennis, board games, kayaking, hiking, billiards, mountain biking, etc. The staff has all the equipment you’ll likely need (e.g., bikes, helmets, tennis racquets, hiking maps, umbrellas, etc.) so just ask. 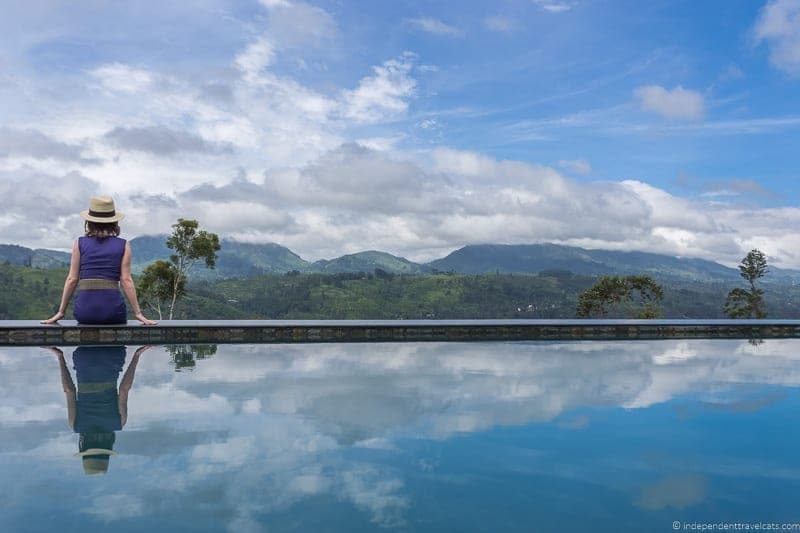 Guests can also arrange for guided day trips to a number of nearby towns and attractions (Hatton, Kandy, Nuwara Eliya, Horton Plains National Park), guided hikes or bike rides, a climb of Adam’s Peak (great photography location), golf excursions, and in-room spa treatments. We got the impression that if there is something you want to do, you should just ask and the staff will arrange it if it is at all possible. 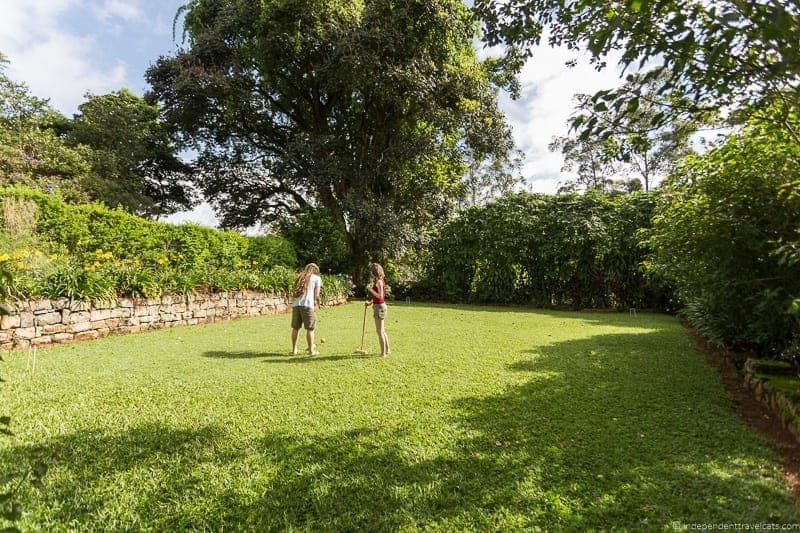 We personally chose to have a very relaxed schedule and in between the wonderful meals and afternoon teas, we chose to hang out at a couple of the pools, play croquet, do a little reading, visit the other bungalows, and enjoy the gardens and hiking paths. The recommended hikes are scenic through the tea fields, past the lake, and some go through local villages. Be prepared for the heat and humidity in Sri Lanka, but given the higher altitude and mountains the “Tea Country” region of Sri Lanka is generally much cooler than the rest of the country. I would recommend packing a sweater or light jacket as the evenings can be a bit cool outside. Note that there are mosquitoes, leeches, and other bugs around so ask the staff before setting out. During our visit, we didn’t have an issue with mosquitos but there were leeches. Luckily none jumped on me (I find them really creepy! 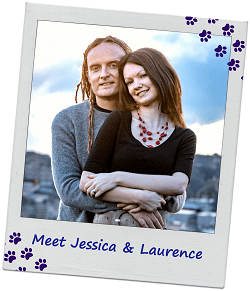 ), but one did on Laurence. The staff has plenty of things you can borrow (hiking trail maps, a salt water spray for the leeches, umbrellas, rain coats, insect repellent) and they can advise you on proper clothing. If you feel more comfortable with a guide, you can also book a guided hike or bike trip. Rooms do not have televisions, but you can request one to be brought in and there is also a DVD player with a small selection of classic DVDs. Laurence was feeling a bit ill one evening so we decided to watch a movie in our room. I can’t think of anything negative to say about our stay, but If there was one improvement I could suggest, it would be a better DVD selection! If you are looking for reading materials for your stay, all the bungalows have small libraries or you can bring your own. If you are looking for a few books set in colonial Sri Lanka, you might consider The Flower Boy by Karen Roberts, The Hamilton Case by Michelle Kretser, or Cinnamon Gardens by Shyam Selvadurai. 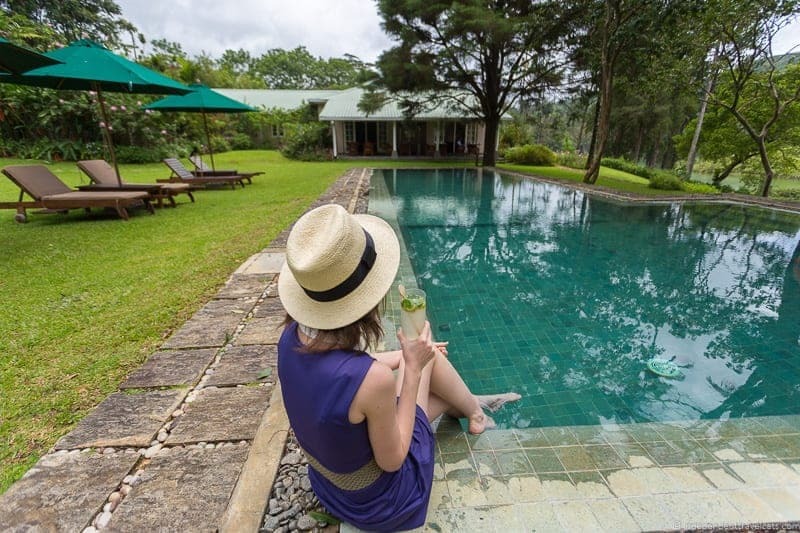 One of the many great things about Ceylon Tea Trails is that the lodging price is inclusive of all your meals, snacks, afternoon teas, soft drinks, and a select range of wines, beers, and spirits. 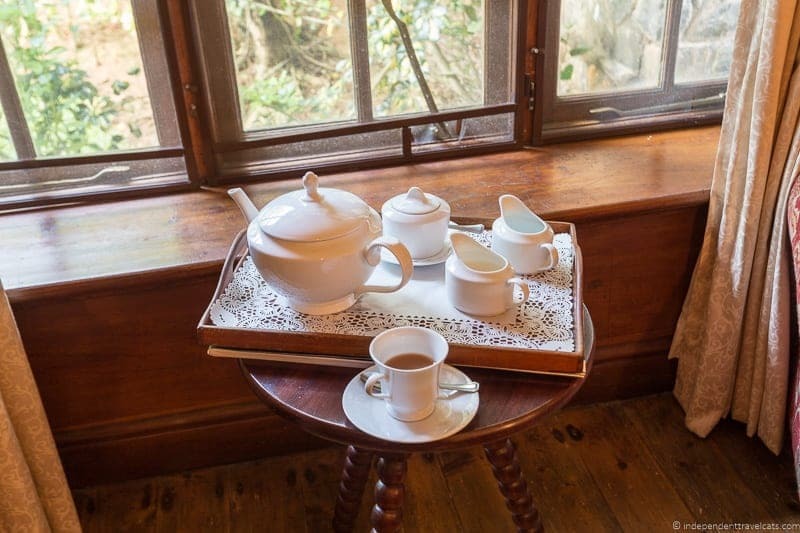 Our days began with Bed Tea, where our butler knocked on our door at an agreed upon time and delivered a tray of tea (or coffee) and biscuits. He’ll bring you cups of tea in bed if you wish and even run a morning bath. After morning tea, we’d roll out of bed and get ready for breakfast. On the terrace, we were greeted with a choice of hot beverages and fresh juices and given the morning news (a 2-page printed copy based on your nationality) to read. Fruit plates are followed by a full Western style or Sri Lankan breakfast cooked to order. For the Sri Lankan dishes it is best to request these options the evening before as they take a lot longer to prepare. A few hours later it was time for a 3-course lunch, a few hours later a 3-tiered tea tray full of finger sandwiches, scones, and little cakes and pot of afternoon tea, and then that evening a 4-course dinner. Chef always asked us about our preferences and any dietary restrictions. 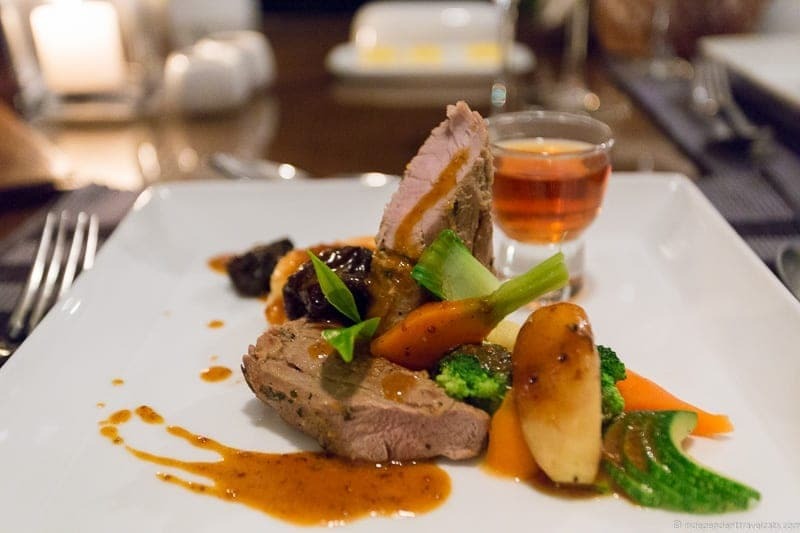 All the meals were good, and most incorporated local herbs grown on the estate as well as fresh local produce. Even tea was incorporated in many of the meals which was a nice touch. For instance we had meat marinated in tea and tea infused crème brûlée. In case anyone gets hungry (we never were! ), snacks are also available all day long! Meals can be served in your choice of locations from in your room to the garden to the dining room. Clearly you can sort of roll from one meal to the next, but it is best to get in some exercise and sightseeing in between to help work off some of the indulgent meals. If you are planning to go on a long hike or bike ride, the staff can prepare a packed meal or picnic basket for you. Tea is obviously the star beverage at Ceylon Tea Trails, and we were given a list of the Dilmah teas which were available. 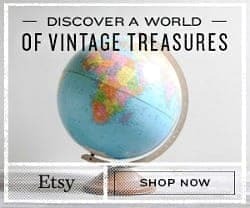 There were the classics (English Breakfast, Earl Grey), some exotic flavors (Rose with French Vanilla and Mediterranean Mandarin), single region Ceylon teas, and even single estate teas. We drank a countless number of cups of tea and had fun trying a variety of the offered teas. Tea, coffee, soft drinks, and alcoholic drinks are available on request at any time of the day. 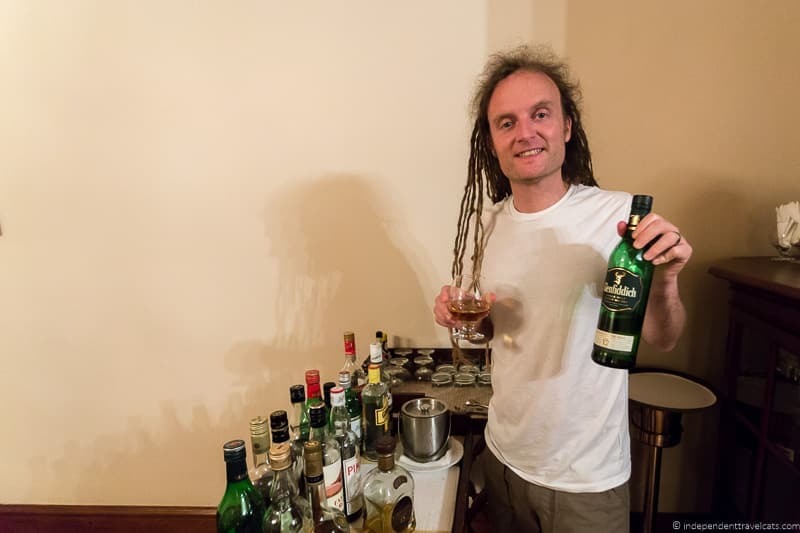 In addition to a menu listing available drinks, there is also a small open bar area in each bungalow’s lounge which has a selection of wines, spirits, and mixers. You can ask for a staff member to make you a drink or help yourself. Note that throughout Sri Lanka, including hotels, alcohol cannot be served on the Poya holidays, which occurs once a month during the full moon. We enjoyed the freedom of being able to have a glass of wine next to a roaring fire in the lounge, take a gin and tonic back to our room, or sip a mojito poolside. We had an amazing 2-night stay at Ceylon Tea Trails and were very sad to have to leave. We could have easily enjoyed the “good life” of a colonial country tea planter life for another week. It was easy for us to forget we were at a hotel as we very much felt at home in the bungalow. We loved the Tientsin Bungalow and its Old World charm and hope that some day we have a chance to return and stay in some of the bungalows which each have their own character. I loved that we could walk or get a complimentary shuttle service to the other bungalows and enjoy meals there as well. Our room was comfortable, spacious, clean, and had all the amenities we needed and more. The food was great throughout our stay, although perhaps not amazing. Food was fresh and local and we loved that our preferences were taken into consideration by the chef. 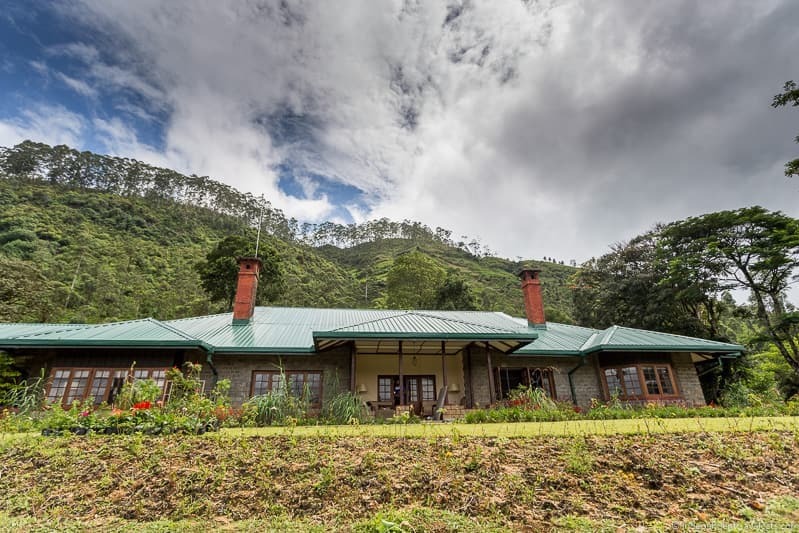 As a tea lover, I was in paradise staying in a tea plantation bungalow, walking around trails surrounded by scenic tea fields, learning about the tea making process, indulging in a daily cream tea, and eating cuisine that has been infused with tea. Other than the amazing location and historical bungalows, the thing that really sets Tea Trails part is the top-notch service and wonderful staff! The staff were friendly and professional, making us feel welcome and that nothing was too much to ask. The all-inclusive nature of Tea Trails makes it a delight as you don’t have to worry about a bill at the end of your stay, and we especially loved that laundry service is included. Our stay was everything I hoped it would be; it was romantic, relaxing, tea-fueled, luxurious, and filled with historical ambiance. It was a perfect 2 days of absolute paradise and if you ever have the chance, I’d definitely recommend it to anyone looking for a honeymoon, anniversary, or luxury getaway in Sri Lanka! 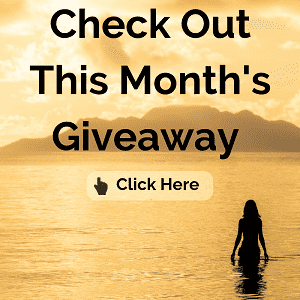 You can also read our full one week day-by-day itinerary for couples that focus on a romantic luxury trip to Sri Lanka which of course includes time at Ceylon Tea Trails. Hope you enjoyed our reliving of our wonderful two days at Ceylon Tea Trails in Sri Lanka! 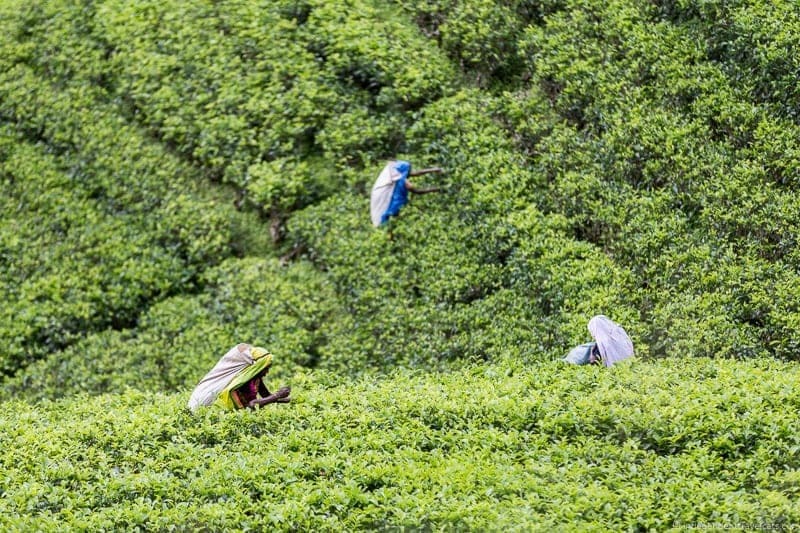 Have you been to Sri Lanka’s Tea Country? Would Ceylon Tea Trails be included in your dream luxury getaway in Sri Lanka? As always, feel free to ask us any questions or leave us any tips or advice of your own! Just returned after a weekend trip from Colombo to Ella by Expo Rail. on the Colombo-Ella journey had 2 open deck sections while on the return just one. Spent most of the journey in the open deck which was great for photography and just enjoying the scenery and fresh mountain air. What a great mix of luxury and history. Definitely looked like a nice getaway. Sri Lanka has been coming up a lot lately, maybe this is a sign. The Ceylon Tea Trails looks very stunning hotel and we are tea lovers.. Thank you for sharing. What an absolutely delightful find in Sri Lanka! We love luxury combined with history – a great way to soak up a country’s past and present…. 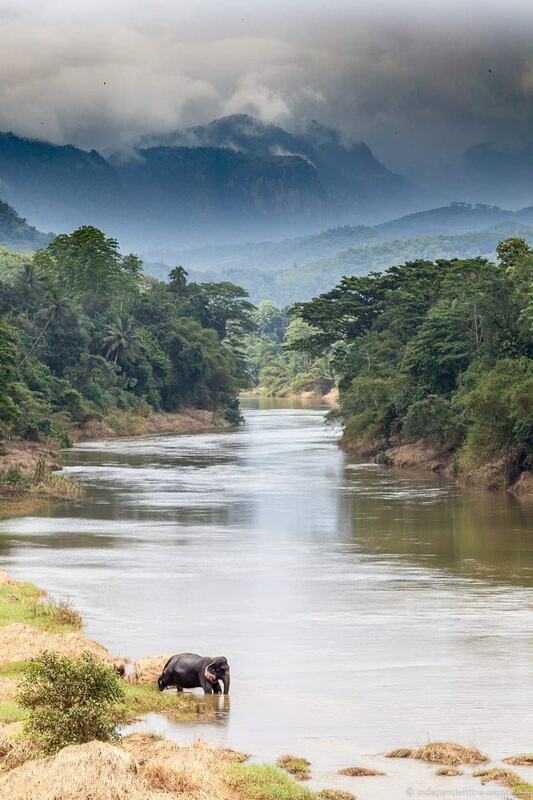 Sri Lanka looks like a really interesting destination to visit – elephants, tea, colonial history, lush scenery. We’re ready to plan a trip :-). This sounds like such an interesting tour and hotel, Jessica. I love tea and the Ceylon tea has a great reputation, so I would really love to do this tour. Besides, these bungalows seem so luxurious! 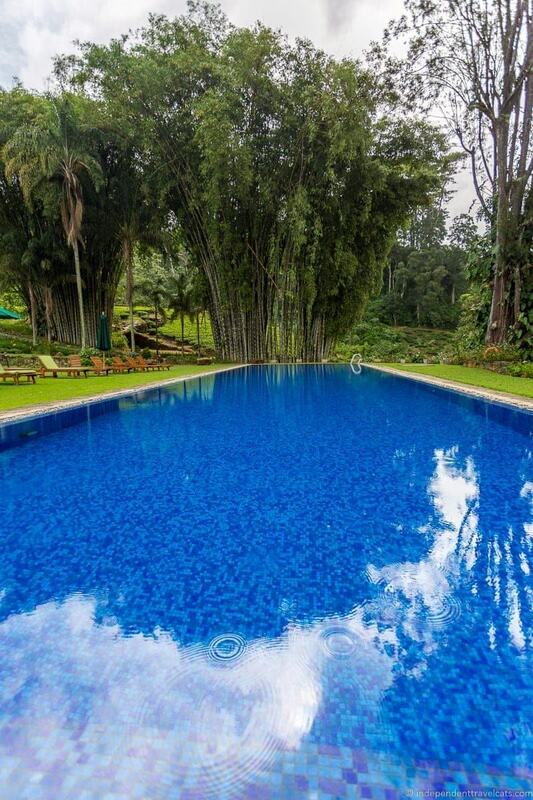 Who wouldn’t enjoy swimming in those crystal clear pools and wandering through those gardens? All I can say is Wow. Ceylon Tea Trails looks and sounds amazing. I’d love the pampered luxury, the scenery and the tea tours! 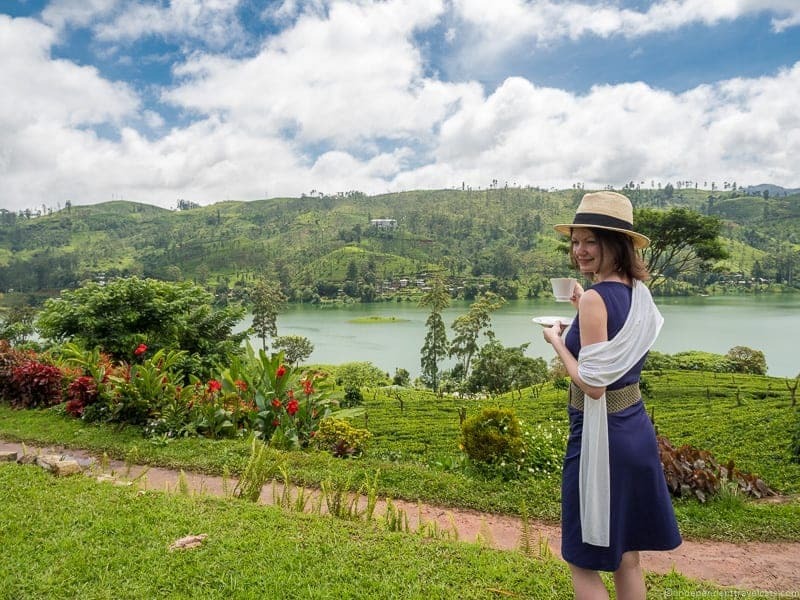 Hi Michelle, I think relaxing, eating, and drinking lots of tea are the best way to spend a few days at Ceylon Tea Trails 🙂 Yes, what is interesting is that Australia is one of the first international markets that Dilmah really made an impact and it is very popular high end tea there. Singapore is also ones of its markets. It is much less common in the U.S. and it is not sold in most places here in the UK yet. My first experience with Dilmah was while having afternoon tea at the Shangri-La Hotel in Paris. When I found out when planning our trip to Sri Lanka that they have a tea themed hotel, I had to go! Hope you get a chance to visit Sri Lanka some day! That’s gorgeous – and so not what I was expecting!! Love the croquet! Ha! It seems to me that you guys stay in the nicest places! I’d either be sitting by one of those stunning pools or maybe digging into a good book. I do love the smell of tea, and the history really brings it to life. I think I would really enjoy watching the process unfold. I have a friend for whom Sri Lanka is her “happy place”… maybe someday I will get there!